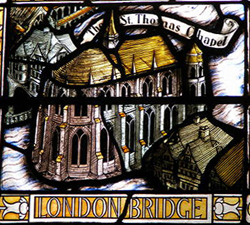 Known informally as the Chapel on the Bridge, the Chapel of St Thomas á Becket was located in the middle of London Bridge and, as the name suggests, was dedicated to the ill-fated archbishop of Canterbury. Founded in 1205, the stone chapel was among the first buildings constructed on the bridge by priest-architect Peter de Colechurch in 1176, who was actually buried beneath the chapel (for more on him and the construction of the bridge, see our earlier posts here and here). Facing downstream and located on a wider than normal pier – the 11th pier from the Southwark end of the bridge and the ninth from the City end – the original chapel was built in the early English Gothic style and consisted of an upper chapel with a groined roof and columns and vaulted lower chapel or undercroft. Standing some 40 foot high, it would have towered over the shops and residences on the bridge. There is some suggestion it was damaged by fire in 1212 and may have had to have been extensively repaired. It’s name ensured its popularity – Becket was martyred in Canterbury Cathedral in 1170, apparently on the orders of King Henry II, and, canonised just three years later, had quickly become the focus of a popular religious cult in his home town of London. The chapel also became renowned as a wayside stop for pilgrims to receive the saint’s blessing before making their way to Canterbury where his shrine was located. But it wasn’t just pilgrims who had an attachment – the chapel was apparently popular among watermen who, when the tide allowed them, were known to tie up their craft on the chapel pier and ascend to the undercroft through a lower entrance. The chapel – which apparently had two priests at the beginning as well as a number of clerks although the number of priests is known to have climbed as high as five in the 14th century – was nominally under the control of the priest of the church of St Magnus-the-Martyr, located at the City end of the bridge. The reality seems to have been however, that the priests and other “Brothers of the Bridge” enjoyed considerable freedom in their roles, including, after 1483, obtaining the right keep alms taken during services provided he made a generous contribution to the parish finances. Like most who worked on the bridge, the priests and “clerks of the chapel” would likely have lived on it. Relics housed in the chapel apparently included fragments of the True Cross and a number of chantries were built inside the chapel in the 14th century – it’s believed this may have led to some overcrowding and been one of the reasons for a major rebuilding of the chapel – this time in the Perpendicular Gothic style – between 1384 and 1397. The chapel survived until the Dissolution when, in 1548, the priest was ordered to close it up and it was desecrated and later converted into a dwelling (later still, parts of it were used as a warehouse). It was demolished over succeeding years – by the late 18th century just the lower chapel remained – with the final remnants removed in the early 1800s. Some bones in a small casket were disinterred in from the chapel undercroft during this process in the early 19th century. Although these were rumoured to be those of de Colechurch, analysis found them to be part of a human arm bone, a cow bone and goose bones. (Other accounts suggest most of Peter’s bones were tossed into the Thames and that a small number were even sold at auction). There’s a stained glass window commemorating the bridge in St Magnus-the-Martyr Church today (pictured above). What a sight it must have been! It’d probably make my list of old buildings in London that I wish still existed. It makes sense that the chapel would have been important for pilgrims, a place to receive the saint’s blessing before leaving town on the long trip to Canterbury. And since Thomas á Becket’s tomb was destroyed during the Dissolution, I suppose it was inevitable that his Chapel on the Bridge would be too. But what a shame.